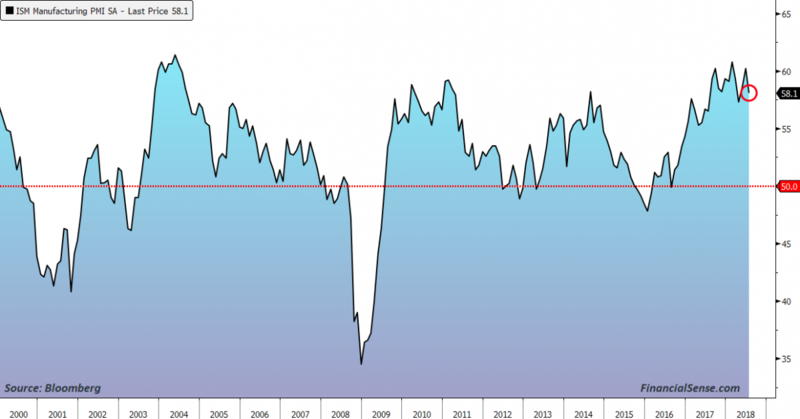 The US ISM manufacturing index for July moderated by 2.1 pts to 58.1 which is a 3 month low and puts it below the average year to date of 59.1. Of note, new orders fell 3.8 pts to 60.2, the lowest since May 2017, backlogs dropped by 5.4 pts to 54.7, the least since November 2017 and export orders fell 1 pt to the slowest since October 2017. Supplier deliveries did ease by 6.1 pts but after rising by a like amount in June. Inventories at the manufacturing level did rise to a 4 month high but remained extremely lean for customers. Prices paid did moderate by 3.6 pts to the lowest since January but remains very elevated at 73.2 (50 is breakeven). Employment held steady, rising by .5 pt to 56.5 which is in line with the 6 month average of 56.7. While we did see the headline drop, the number of industries reporting growth did remain at 17 of 18 surveyed. The ISM summed up the report with the positives and negatives that we are all aware of, “Demand remains robust, but the nation’s employment resources and supply chains continue to struggle. Respondents are again overwhelmingly concerned about how tariff related activity, including reciprocal tariffs, will continue to affect their business.” I don’t need to add anything more. US Treasuries didn’t rebound on the headline miss, yields remain at the high of the day with the 10 yr sitting right on 3.0%.